With Dembele starting against Huesca and playing more than an hour, the expectation is that he will start in place of Coutinho against Manchester United. In the first leg, we did miss him and his pace. He starting means we will have the pace in counter and that will pin the defense back. The other only change I expect from the first leg is Sergi Roberto coming in place of Semedo. Semedo was good in patches against Manchester United and maybe Valverde will go with Roberto for the first leg. 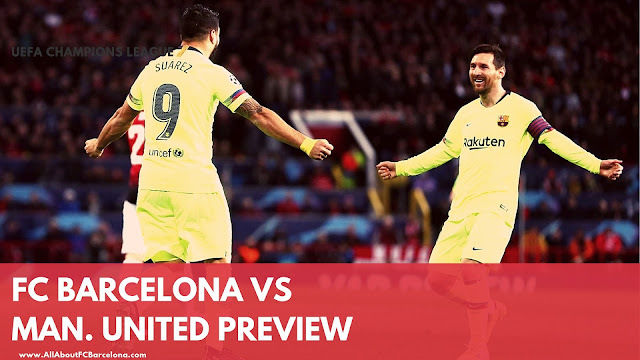 Barcelona needs to go for their high press game against Manchester United. At Old Trafford, it was Manchester United who was making us comfortable with their pressing. We tried playing so much long ball, a strategy which is a folly against a team like Manchester United. Messi and company need to build from the back and for that, they need to pin their opponents back. Dembele's pace means that Manchester United would vary of the threat in counter. But at the same time, we need to create space for Messi to work his magic. Manchester United would be hoping to repeat what they did to PSG. Barcelona would be hoping that they don't repeat what they did last season against Roma. Barcelona needs to move first and take control of the game and kill the game early.